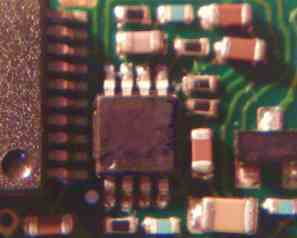 EM043J is a small random number module intended for a microcontroller with an analogue amplifier. The noise source is Johnson resistor noise. The circuit may need extra shielding in some applications. There is no processor included in the circuit. We can optionally include a processing unit, including software, or we can provide a software for your existing processor. The price tag is for a license solution, where the customer supply all components, mount the components and download software to processor(s). We include reasonable schematics and also a layout. For adjustments and customer specific software we add a fee for the development time. If it is easy to specify, or include, the embedded processing software into your application, we will do so with no extra fee. With a paid order volume above 50.000 units, the licence is free. The paid license may be applied to several of your products, but is restricted to a single customer. Output: Analogue output (Z<1.0 kOhms), Low output voltage. Processing: No processing included in circuit. Software may be run on host processor or a microcontroller may be used.